In the lovely town of Pepperell, there are many beautiful homes with much history. Many of these homes, are in need of rejuvenation and renewal. This home was no different. 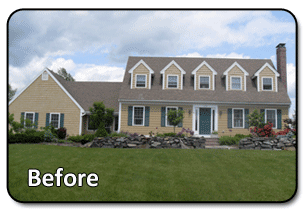 The homeowners of this local Pepperell home, were tired of the old tired cedar shingle siding and decided to make a move and find a local contractor to complete the work on their home. The homeowners were very selective and cautious with what contractors were going to work on their home, but the Everlast team rightfully made them feel right at home and peaceful. 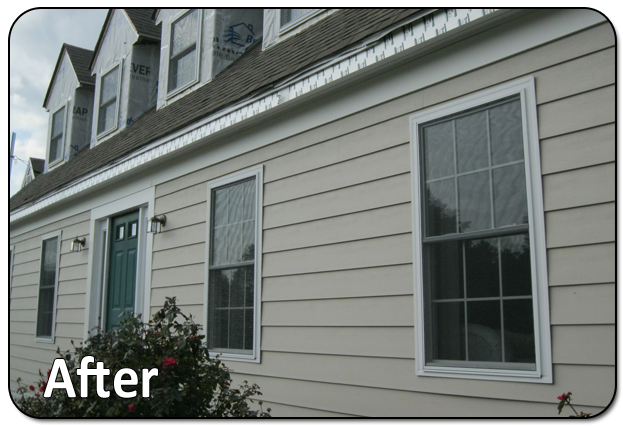 After meeting with one of our team members and getting estimates from other contractors, the homeowners decided that nothing compared to Everlast Composite Siding and soon enough they chose to sign the dotted line. At the end of the day, the homeowners chose the million dollar answer and installed the Everlast Sand Dune colored 7-inch composite board on their home and shed. We replaced all their trim on the home and as well as the garage with Trex trim and finished the siding off with stainless steel ring shanked nails.